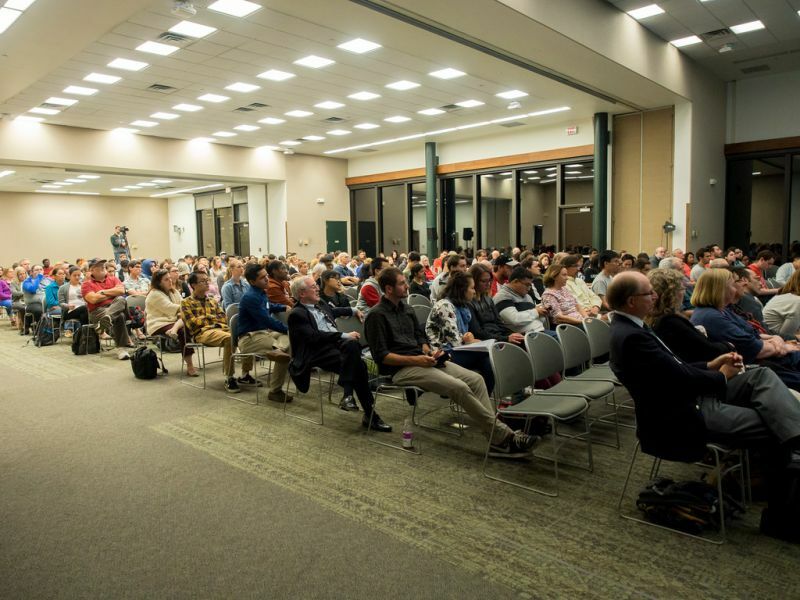 On April 18, 2017, Rutgers Climate Institute, along with the Cook Campus Dean, co-sponsored Rutgers University Students for Environmental Awareness’ (SEA) film screening of "Before the Flood" featuring Leonardo DiCaprio's journey to 5 different continents in learning and revealing the impacts of climate change. This film presented by National Geographic uncovers the growing concern regarding the change in global climate and how certain countries are significantly impacted. At the same time, the audience is encouraged to take bold individual actions to prevent further damage and to protect our home. The event was part of SEA’s Earth Week Festival. 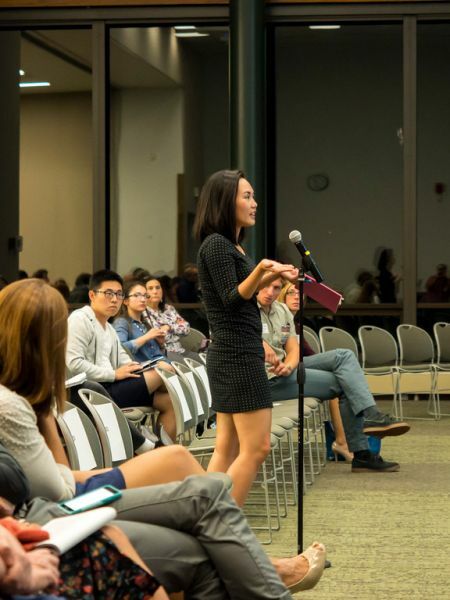 RCI Affilates Karen O'Neill (Human Ecology), John Weingart (Eagleton Institute of Politics), and Bob Kopp (Earth and Planetary Sciences) participate in a panel discussion moderated by Pinky Liau, President of Students for Environmental Awareness. On Wednesday April 5, 2017, the award-winning and best-selling author Kim Stanley Robinson visited Rutgers University where he read from his recently released novel, New York 2140, which presents a vision of our region in a future of extreme sea-level rise. After his talk, Robinson was joined by a panel of distinguished Rutgers faculty with expertise in climate science (Robert Kopp), urban planning (Clinton Andrews), urban agriculture (Laura Lawson), and the environmental humanities (Jorge Marcone) who discussed the novel and its vision. 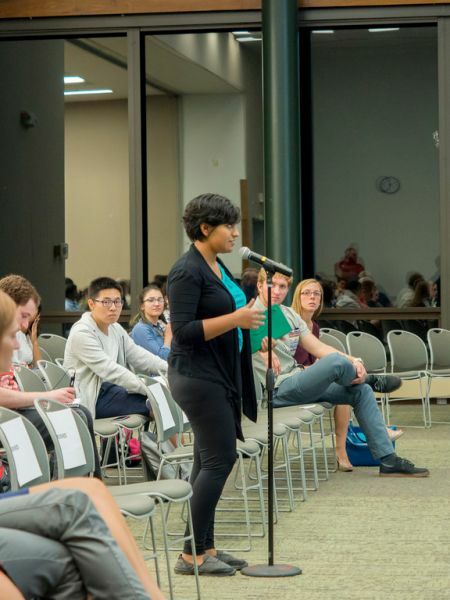 Rutgers undergraduate and graduate students, including student leaders from various campus organizations had an opportunity to speak with Robinson ahead of the lecture during both in-class discussions as well as during dinner. 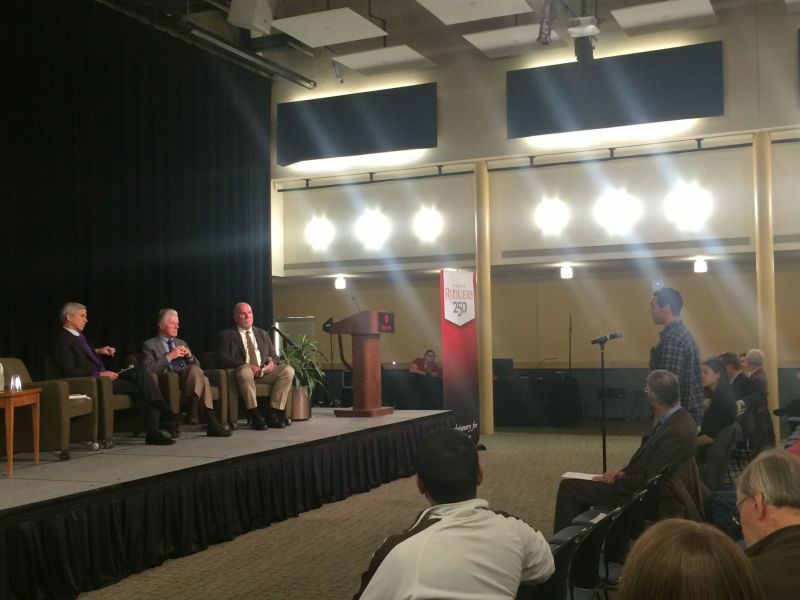 Read more about the evening in this piece by the Rutgers Daily Targum. 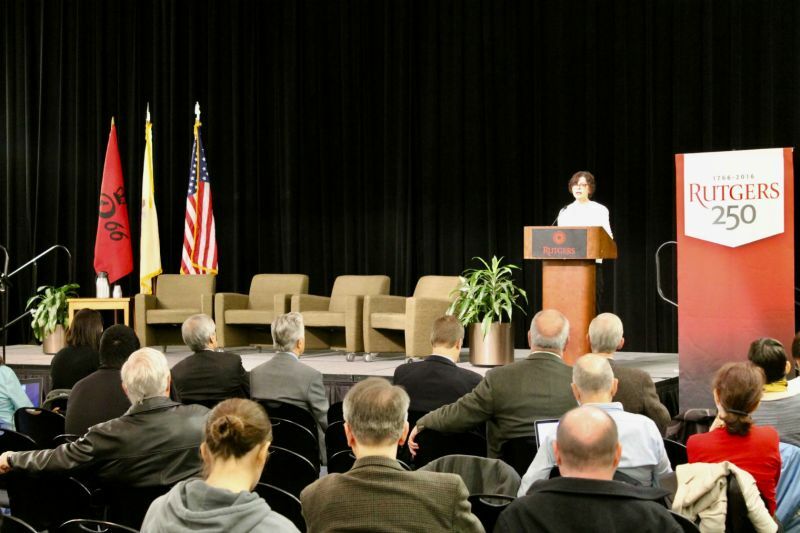 The event was hosted by the Rutgers Climate Institute along with the Coastal Climate Risk and Resilience Initiative; Cook Campus Dean; Honors College of Rutgers University; Institute of Earth, Ocean, and Atmospheric Sciences; Rutgers University-New Brunswick America Converges Here; School of Environmental and Biological Sciences Executive Dean; and Undergraduate Academic Affairs. On Thursday evening March 2, 2017, the Rutgers community was treated to an inspiring lecture by Dr. Lonnie G. Thompson, Distinguished University Professor in the Geological Sciences and Research Scientist at the Byrd Polar and Climate Research Center, The Ohio State University who spoke on Past, Present and Future of Glacier Archives from the World's Highest Mountains. Dr. Thompson's research has propelled the field of ice core paleoclimatology out of the Polar Regions to the highest tropical and subtropical ice fields. He and his colleagues from Ohio State have developed light-weight solar-powered drilling equipment to acquire climate histories from ice fields all over the world including the tropical South American Andes, the Himalayas, and on Kilimanjaro. Dr. Thompson's talk centered on glaciers as recorders and early indicators of climate change. The ongoing widespread melting of high-elevation glaciers and ice caps, particularly in low to middle latitudes, provides strong evidence that a large scale, pervasive and in some cases, rapid change in Earth's climate system is underway. Dr. Thompson shared observations of glacier shrinkage during the 20th and 21st centuries. 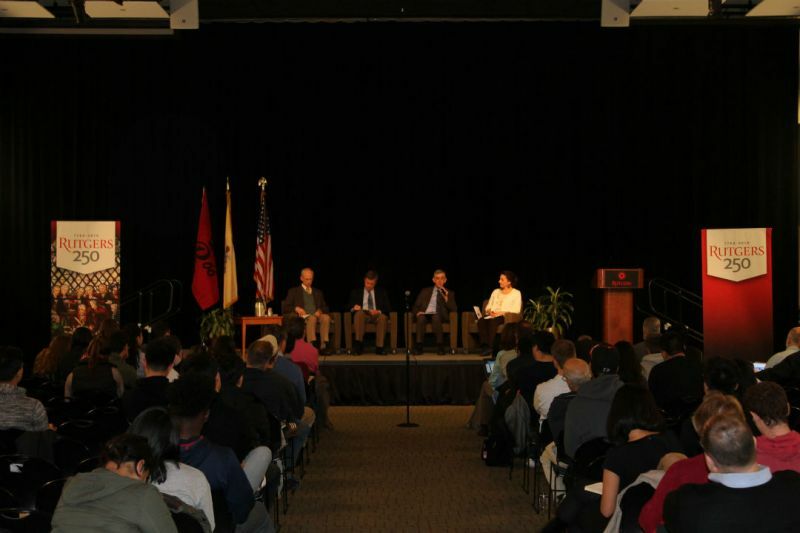 The event was sponsored by Rutgers Institute of Earth, Ocean, and Atmospheric Sciences and co-sponsored by Rutgers Climate Institute and Rutgers University-New Brunswick America Converges Here. 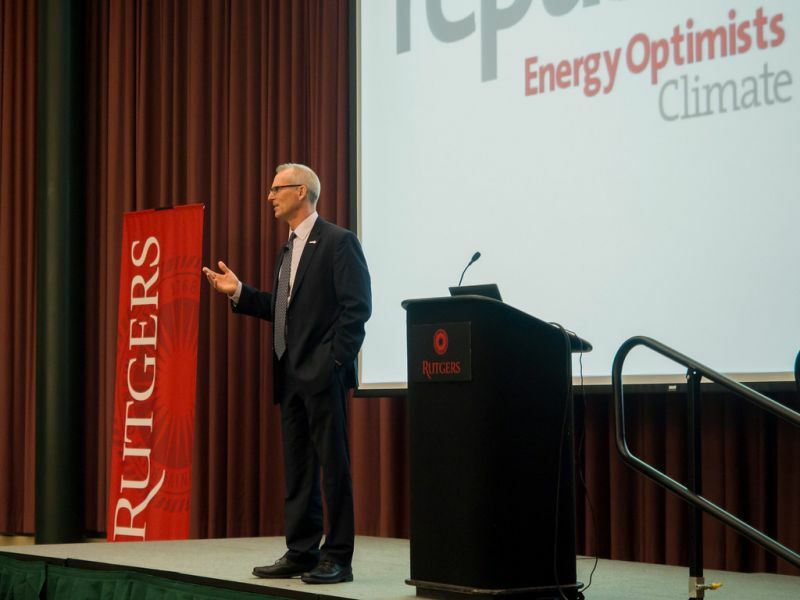 On November 18, 2016, Rutgers Climate Institute held its annual Rutgers Climate Symposium, the theme of which was Climate Change, Ecology and Health. This one-day symposium is intended to stimulate interaction and collaboration among the community of natural and social science researchers and university students interested in climate change who are from institutions in the greater NJ, NY and Philadelphia region. Over 200 attendees representing more than 20 research institutions participated in the symposium which featured talks on the symposium theme and a poster session displaying scholarship on a range of climate change topics from participants throughout our region. Local communities need usable climate change exposure risk information to support resiliency land use planning. Coordinating the production of exposure risk information that is usable at the local scale is a challenge particularly due to the complex socio-environmental factors that shape information accessibility and perceptions of information saliency, credibility, and legitimacy, usability aspects that vary within and among communities. Focusing on these usability dimensions, this study advances a scalable method to produce risk information on property value and tax base exposure to sea-level rise in four coastal New Jersey counties. We produce two complimentary information products fit for expressly distinct uses by researchers and managers. The first product is projected exposure to sea-level rise through the 21st century aggregated by county and municipality. The second product is a collaborative mapping protocol for engaging communities to investigate social impacts from access to exposure risk information to collaboratively refine usability. We also explored a method to verify flood model spatial extents by comparing modeled Superstorm Sandy parcel exposure with observed parcel inundations. The prevalence of Allergic Airway Disease (AAD) has grown globally resulting in increased numbers of emergency department visits and hospitalizations. Clinical studies show that AAD can be exacerbated by the synergistic action of aeroallergens such as pollen and fungi, and atmospheric pollutants such as ozone. Furthermore, climate change has critically affected atmospheric processes involved in the dynamics of air pollution systems and emissions of natural pollutants such as pollen and spores. Previous studies, involving data from nationwide observations of airborne pollen counts of selected plant species in conjunction with climatic factors, indicated that the start date and length of pollen season, the average peak value and annual total of daily counted airborne pollen have been affected substantially by the changing climate. The present study investigates co-occurrences of peak ozone concentrations and peak pollen counts across the contiguous United States (ConUS). The concentrations of pollen in base years (2001-2004) and future years (2047-2050) are simulated with an adapted version of CMAQ (the Community Multiscale Air Quality) employing a grid with 50 km by 50 km horizontal resolution, and compared with the ozone concentrations of historical simulations and future projections that were completed by multi-university/agency consortium including USEPA and NCAR. Ongoing work employs spatiotemporal correlation analysis to examine patterns of co-occurring ozone and pollen concentrations. The outcomes of this study are expected to be useful in supporting development of strategies for managing health-impacts of co-occurring photochemical pollutants and allergenic pollen. The Sandy Hook Unit of the National Park Service’s Gateway National Recreation Area is a 10-kilometer-long spit that has historical and natural resources threatened by global climate change, including sea-level rise (SLR), changes in precipitation and groundwater recharge, and changes in the frequency and severity of coastal storms. Fresh groundwater resources are important to ecosystems of Sandy Hook, including the Bayside Holly Forest, one of only two known old-growth American holly maritime forests in the world. Groundwater flow is controlled by recharge from precipitation and discharge to evapotranspiration, surface seeps, and submarine seeps. Analysis of groundwater-flow simulations indicate SLR will cause the water table to rise, thinning the unsaturated zone and the freshwater lens overlying saline groundwater. Results of simulations of SLR of 0.6 meters (m) indicate the water table may rise above land surface in 8 percent of the spit, likely causing tree mortality in low-lying parts of the Holly Forest. The SLR-induced water-table rise will increase groundwater discharge to evapotranspiration and seeps, leading to the freshwater-saltwater interface rising up to 19 m and possibly causing shallow groundwater salinity to exceed plant tolerance in some low-lying areas. The shallow groundwater system is not sensitive to a 10-percent increase or decrease in recharge. Most research on bicycle route choice focuses on ordinary bicycles and most research on route choice of e-bike trips focuses on stated preferences and attitude questionnaires. There is little research on the revealed preference of e-bikers' riding routes. This study examines the characteristics of e-bike trips, users, and the urban features of the city. The focus is on the chosen riding route within the built environment using Geographical Information Systems (GIS) analysis. Ninety-three chosen routes frequently used by 118 e-bike riders in Tel-Aviv, Israel are analyzed. They are compared with the analogous calculated shortest possible routes. The rate of existing bikeways and the area allocated to urban "points of congregation" along the route are considered. The latter are areas in which there is a concentration of "attractive activities," including employment, shopping, commerce, businesses, public amenities, etc. E-bike riders prefer small streets with little traffic over main streets, and streets with bikeways and fewer points of urban congregation. Routes selected by e-bike riders have 73% more bikeways than in the analogous shortest routes. E-bikers are willing to extend the trip's distance in order to utilize bikeways. The shortest routes have 35% more land that is designated for employment, shopping, commerce, businesses, and public amenities than the routes the e-bike riders chose. The main conclusion is that electric bikes are a new and distinct mode of transportation substituting for motor vehicles (car and public transportation), but they need the infrastructure and urban environment appropriate for ordinary bikes. Arbuscular Mycorrhizal Fungi (AMF) are widely present in the roots of various plants forming symbiotic associations and ensuring efficient uptake of nutrients to its host plant even under stress conditions. Studies report that mycorrhizal fungi have a significant role in sustainable agriculture as they can help plants easily adapt to the negative impacts of climate change, thereby reducing agricultural losses. This research aims to explore the diversity and abundance of AMF species from the invasive (Phragmites australis) and native (Spartina alterniflora) marsh grass species of the Blackbird Creek Marsh in Delaware. Soil and root samples from various seasons were collected, genomic DNA was isolated and nested PCR was performed. Most of the AMF species identified in this study are members of the Glomeraceae family. AMF species were absent in the soil samples confirming that the AMF species in the marsh grass roots are endosymbionts. Real time PCR is being performed to study the abundance of these AMF species. The future focus of this research is aimed to induce salt stress in Spartina alterniflora while treating it with AMF spores and studying the recovery rate of the plants from salt stress. The nation's coasts are home to much of the American population, they play an important role in the US economy, and they support many valuable ecosystems. About four million Americans currently live within one meter above the high tide line, and 23 million live within six meters. In many parts of the country, sea-level rise between 1960 and 2010 has already led to a two- to five-fold increase in the rate of "nuisance" flooding, and rising seas are making extreme floods more likely. Further amplifying coastal flood risk, intense hurricanes may become more frequent in a warming world; while frequent heat, humidity and precipitation extremes provide additional stresses to societies, economies, and ecosystems. Yet traditional, disciplinary programs are poorly configured to train the workforce needed to assess coastal climate risk and to develop and deploy integrated strategies for increasing coastal climate resilience. Coastal Climate Risk & Resilience (C2R2) is an NSF Research Traineeship (NRT) working to prepare the workforce that will build coastal resilience in the face of climate risks. C2R2 will train graduate students who conduct research to better integrate all the elements of coastal systems and to communicate effectively with coastal stakeholders. Bridging the gap between the scientific community and the public has always been a challenge for educators. Climate change is progressing rapidly, which makes public education equally important as research. This poster describes the process of creating video resources for teachers, which aim to provide educators with teaching tools that can foster climate change literacy. The video teaches educators about a lab activity titled “The Incredible Carbon Journey,” from the book Discover Your Changing World with National Oceanic and Atmospheric Administration. This exercise shows participants how burning fossil fuels impacts the carbon cycle and how the industrial revolution has increased the amount of carbon dioxide in the atmosphere. In this interactive game, each student acts as a carbon molecule cycling through the planet’s spheres before and after the industrial revolution. The MADE CLEAR project offered a workshop to pre-service teachers to educate them about the carbon cycle and how to use this game effectively in classrooms. From the recordings, MADE CLEAR created an online video resource for any educator to access. These resources will help educators easily integrate lessons on climate change into their curriculum to promote climate literacy and provide students with the knowledge to make environmentally sound decisions. New Jersey’s coastal municipalities face many coastal related hazards, largely related to flooding. As municipalities continue to work to be better prepared for today’s conditions, climate change and sea level rise are likely to increase the intensity and frequency of flooding related hazards. Adapting to these changing conditions often requires assistance from outside groups. The Jacques Cousteau National Estuarine Research Reserve has worked with municipalities throughout the state to implement the “Getting to Resilience” process. The Rutgers Edward J. Bloustein School of Planning and Public Policy has brought mapping and planning document suggestions to multiple communities. 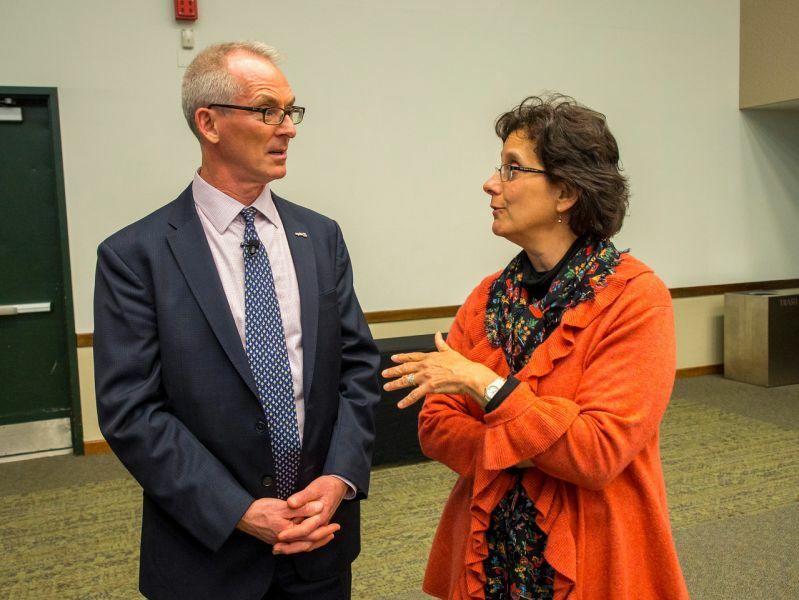 As these two groups work together to share resources and skillsets, New Jersey municipalities benefit from the leveraged efforts of two leaders in coastal resiliency. This partnership now aims to take the latest and best science from recent reports such as the New Jersey Climate Adaptation Alliance’s “Assessing New Jersey’s Exposure to Sea-Level Rise and Coastal Storms: Report of the NJ Climate Adaptation Alliance Science and Technical Advisory Panel”, newly developed tools such as the Community Vulnerability Assessment, and regional focuses such as the NJ FRAMES project to further increase the scope and level of impact of Rutgers assistance for New Jersey’s coastal communities. Density information derived from the intensity of blue light reflectance (BI) of the latewood in tree rings is a new method of tree-ring analysis that strongly correlates with instrumental summer temperatures. In many cases, tree-ring density derived from BI captures a stronger climatic signal compared to the measurement of ring width, which is typically used in dendroclimatic studies. Mongolia, a country in central Asia with a semi-arid climate, has been rapidly warming leading to an influx of drought conditions. Knowledge of past climatic conditions is limited due to sparse meteorological records. The purpose of this study is to improve existing dendroclimatic records in this region. To determine if there are differences between the response among tree species, existing ring-width chronologies from Mongolia were analyzed in comparison to the new BI methods. We focus on developing BI records from Siberian pine and Siberian larch from Solongotyn Davaa (Sol Dav), a timberline (2420 m) site in the Tarvagatay Mountains. Hundreds of tree core samples have been revisited for analysis using BI. We find that BI has a stronger climate signal then RW and will result in a millennial length temperature reconstruction that was not previously possible using RW alone. Using survey data from longitudinal field research projects in New York City and coastal New Jersey, this study identifies key elements of social resilience in neighborhoods and communities impacted by Hurricane Sandy in 2012. A definition of social resilience is developed using empirical evidence from the 2013 Associated Press-National Opinion Research Center survey of neighborhoods and communities in the greater New York City area, and the 2014 Internews/Eagelton Institute of Politics survey of Staten Island and storm-impacted Brooklyn neighborhoods. Social resilience operates at three levels, the institutional, associational, and communal level; and is a necessary component of disaster response and long-term recovery processes. Social resilience occurs at community and organizational levels and is reliant upon social ties, communication channels, information flows, and the individual and physical attributes of a community and its citizens. This is a preliminary model focused on calibrating a hypothesis measuring the importance of social resilience to community recovery and adaptation. A visualization and preliminary findings of the social resilience model using the survey data are presented. The genetic basis of adaptation is important for understanding how species will respond to rapid environmental changes. Theory predicts that species occupying a wide geographic area characterized by an environmental cline can become specialized to match their local environment, if dispersal is low enough. Thus, local adaptation can result in genetic divergence at particular loci between populations occupying different habitats. Here, we examine population structure and candidate loci under selection in summer flounder (Paralichthys dentatus), a popular fished species that can be found across a wide thermal gradient spanning 25°C. Using 1137 SNPs from 241 adult fish representative of the species geographic range, we first tested for population structure. Summer flounder exhibited no ecologically significant substructure, but a distinct group of genetically similar fish was found on Georges Bank in the northern portion of the species range. To test for candidate loci under selection, we used BayEnv2 to reveal high correlations between allele frequencies and latitude against a backdrop null model that accounts for non-independence between populations. These loci may be candidate loci under selection, and further investigation into gene function is warranted to better understand local adaptation and adaptive potential to changing ocean conditions in summer flounder. The objective of this project was to identify likely, high-quality breeding habitat for Arctic-nesting shorebirds that is considered to be resilient to climate change. The focus was on the shorebird species, the Red Knot (Calidris canutus) which was chosen to serve as a proxy for a broader suite of Arctic-nesting shorebird species. We have combined existing shorebird population (derived from the literature, established sightings databases and Arctic experts), environmental and modelled climate data (for the present day) with species distribution models (SDM) to identify and map current, high-quality locations for the target species. Once fit, the SDMs were used to map the expected species distribution under a projected future climate in the year 2070 for a range of warming scenarios from ‘moderate-case’ (i.e. Representative Concentration Pathway (RCP) 4.5) to ‘worst case’ (RCP 8.5). Further geospatial analysis to identify landscape-scale sites that are expected to retain suitable or support new suitable shorebird habitat under climate change and to identify the current protective status. The full (both the rufa and islandica subpopulations) vs. rufa-only Red knot models suggest diminishing habitat suitability in the southern section with some expansion in the central section of the rufa Red knot range. The JCNERR convened a roundtable of mosquito control and land management agencies to examine the intersection between sea level rise, salt marsh structure, habitat modification/restoration, and nuisance mosquito populations which can pose serious health risks to humans, livestock, and pets. Chief concerns are how climate change and sea level rise may affect marsh habitats and consequent mosquito production but also how past physical alterations to reduce mosquito habitat affect the ability of salt marshes to maintain their relative elevation position and thereby their long term resiliency in the face of sea level rise. Recognizing the valuable role that salt marshes play in buffering coastal communities, coastal decision-makers are advocating various techniques to restore and sustain salt marshes under sea level rise and shoreline erosion as a means of promoting enhanced resiliency of coastal communities. Restoration techniques designed to maintain marsh elevation capital will likely affect mosquito production. High resolution habitat mapping/modeling coupled with enhanced monitoring of mosquito populations and identification of other critical environmental cues would aid in their strategic planning and operational decision-making. The Greenland Ice Sheet (GrIS) has a substantial impact on the current global sea level rise. Many of the models currently used to estimate ice sheet mass loss do not account for how streams route meltwater and sediment off the surface, how these streams change spatially over the melt season, and how sediment loading impacts how much solar radiation the ice sheet absorbs. To address these questions, a season-long campaign was conducted in 2016 near Kangerlussuaq, in Southwest Greenland, an area highly significant due to its high melt rates and sediment loading. Supraglacial discharge measurements, ablation stakes, repeat UAV-based multispectral imagery, meteorological data, and sediment sampling will be used to determine controls on diurnal variability of flow rates, spatial variability of ablation rates and albedo, and sediment transport capacity of streams. We hypothesize that spatial distribution of supraglacial streams, dark/carbon-rich sediment, and local ice topography has a large effect on the ice albedo and therefore the amount of energy available for meltwater production. The analysis will show what physical processes may change Greenland’s albedo in the long term and the efficiency of meltwater transport to the ocean. Heavy metals are elements that can cause toxic effects in living organisms even at low levels of exposure. Their applications in domestic, agricultural, technological and industrial sources have increased the risk of environmental pollution. Climate change effects can aggravate the impact of heavy metals on the environment and the organisms living within these environments. Studies report that microorganisms can efficiently remove these toxic metals from soils and water. The present study focuses on isolation, identification, and characterization of lead and cadmium resistant bacteria from marsh soils. These bacteria were isolated from the soils collected from Black Bird Creek Marsh, located in Townsend, Delaware. For the isolation of these bacteria, soil samples were inoculated on Luria Broth (LB) plates, enriched with various concentrations of lead nitrate and cadmium chloride. Bacterial colonies were enumerated and genomic DNA was isolated using phenol: chloroform method. DNA was amplified using universal bacterial primers (27F/1492R) and the PCR amplicon was identified by Sanger sequencing. Preliminary results showed that bacteria from this marsh soil can grow in a medium containing lead up to 1000ppm and cadmium up to 500ppm. The future goal of this research is to isolate bacteria that have bioremediation applications. The retreat rate and iceberg calving of the Mendenhall Glacier of Juneau, Alaska is representative of the significant impact global climate change has had. The rate of acceleration of Glacier melting is continuing to rise at an alarming rate, as the Mendenhall Glacier has retreated more than 1,830 feet since 2007 (Huffington Post). The complex interaction of temperatures rising and icebergs calving is the inducing factor for such retreat (Juneaueempire). The aforementioned iceberg calving, which accelerates the retreat rate, also in itself, is accelerated by increasing temperatures (Seattle PI). The associated impacts of calving hold potential safety consequences of tourist activities of Juneau. Mendenhall lake is a tourist destination situated near the Ice Terminus. Utilized for various tourist activities, including canoeing, the potential for injury due to calving is evident. Consequently, as temperatures continue to rise, iceberg calving will accelerate, as will potential risk factors for tourist activities adjacent to the iceberg. MODerate resolution Imaging Spectroradiometer (MODIS) albedo products have been validated routinely over spatially uniform, snow-covered areas of the Greenland ice sheet using the so-called single ‘point-to-pixel’ method. This study examines the spatial representability of albedo over spatially heterogeneous surfaces in the lower ablation zone in southwest Greenland. We compare a high density of in situ narrow and broadband surface albedo measurements collected with a spectroradiometer to high quality MODIS Collection V006 daily blue-sky albedo retrievals for two corresponding MODIS pixels. We use high-resolution WorldView-2 (WV-2) surface reflectance as an intermediate scale to characterize within-MODIS pixel variability, and quantify the ground footprint necessary for spatially representative in situ observations points using semivariogram analysis. Our results using several ground-based samples within each MODIS pixel (multiple ‘point-to-pixel’ method) will reveal differences in accuracy among narrow and broadband albedos as well as over spatially homogenous and heterogeneous surfaces. The semiovariagram analysis shows that the minimum observational footprint needed for a spatially representative sample is 30 m in the homogeneous pixel, and an inadequately large size (500 m) in the heterogeneous pixel. This demonstrates that single ‘point-to-pixel’ methods alone are insufficient in characterizing and validating the variation of surface albedo displayed in the lower ablation area. Concurrent surface albedo measurements derived from existing automatic weather stations, low-flying vehicles (airborne or unmanned) and high-resolution imagery (WV-2) is needed to resolve high sub-pixel variability in the ablation area, and thus, improve our characterization of Greenland’s surface albedo. The recent emergence of Zika virus (ZIKV) in Latin America and the Caribbean occurred during severe climate conditions that have been associated with the 2015–2016 El Niño event, and/or climate change, although no quantitative assessment has been made to date. Analysis of related flaviviruses transmitted by the same vectors suggests that ZIKV dynamics are sensitive to climate seasonality and longer-term variability. Here we demonstrate that the extreme climate observed in South America during the current epidemic were not caused exclusively by El Niño or climate change, but by a combination of climate signals acting at multiple timescales. In Brazil, the dry conditions present during 2013–2015 are primarily explained by year-to-year variability superimposed on decadal variability, with little contribution of long-term trends. In contrast, the warm temperatures of 2014–2015 resulted from the compound effect of climate change, decadal and year-to-year climate variability. ZIKV response strategies made in Brazil during the drought concurrent with the 2015-2016 El Niño event may require revision in light of the likely return of rainfall associated with the borderline La Niña event expected in 2016–2017. Temperatures are likely to remain warm given the importance of long term and decadal scale climate signals. The need for consideration of equity is increasingly recognized in efforts to promote resilience and adaptation to climate change in cities and urban regions. Yet understandings of the meaning of equity in urban adaptation are highly varied and sometimes politically contested. For city managers, inclusion of equity in adaptation is typically understood in terms of identifying areas with high social vulnerability and targeting them for adaptation assistance. By contrast, for local urban communities, equitable adaptation means inclusion of community representatives in both identification of local vulnerabilities and adaptation strategies. Our study describes an on-going assessment of community-based equity in climate adaptation in New York City. This study is being conducted through collaborative partnerships between the Community Equity Workgroup of the New City Panel on Climate Change and several long-established community-based organizations (CBOs). Each of the CBOs is starting to confront the issue of climate justice as sea-level rise and increased temperature worsen flooding and air pollution in their communities. Through these partnerships, the workgroup helps to identify climate-related equity concerns, strategies for reducing vulnerability and promoting equity, ways in which the city can facilitate community-based adaptation and resiliency efforts in addition to develop a replicable process for community-based equity assessment. Climate change is predicted to drive poleward shifts in species range as temperatures increase. Estuarine fishes of the US East Coast are important but challenging study organisms for observing these range shifts. While they track local climate velocities and are sensitive to temperature changes, they can be highly migratory and may use estuarine habitats facultatively. Using a long-term data series collected via trawling at the Rutgers University Marine Field Station in southern New Jersey, we examined the change in juvenile fish assemblages in the Mullica-Great Bay estuary over time and its association with marine and atmospheric climate variables. A latent trend in assemblage change weighted towards more freshwater species over ten years was significant. Average summer water temperatures explained the greatest variation in fish assemblages over the study period, with average winter water temperatures showing a high degree of correlation to summer temperatures. September assemblages were found to be changing more significantly than July assemblages across the system, particularly in the Estuarine and Freshwater habitats. This could indicate a phase lag in the effects of changing climate on species caught. Overall, changes in local watershed conditions appear to have had a greater effect on the assemblage within the system than changes in the oceanic environment. It is now well established that extreme heat poses a serious health risk, causing many excess deaths each year. However, near the tropics, where temperatures exhibit less variability and hot weather is the norm, the perceived risk is often low. However, the blistering temperatures reached in South Asia in recent years have contributed to a growing awareness that heat waves do pose a serious health risk in this part of the world. Reliable forecasts are an essential building block of an effective early warning system. These are needed at a sufficient lead time to enable preparatory action to be taken in advance of a heat wave. Yet good forecasts are not possible without a solid understanding of the occurrence and behaviour of heat waves, and so far there has been little research in this area for Bangladesh. Decisions must be taken over when to issue a warning, and this requires an event definition that is both (a) related to human health outcomes and (b) forecastable using available weather and climate information. The goals of this paper are twofold: 1) to investigate an appropriate definition for heat wave events in Bangladesh and (2) to explore the causes and predictability of heat waves from a climate perspective. Results suggests that opportunities exist for extreme heat forecasts from days to months ahead. In particular, from extended range prediction of heat waves in Bangladesh, offering the potential to provide more advance warning and increasing the capacity to prepare. El Niño and Malaria in Eastern Africa: The Ethiopian experience and recent advances in data and tools. Malaria in Ethiopia is highly sensitive to climate, with epidemics historically occurring in unusually warm and wet years. The climate of Ethiopia, one of the most complex in Africa, is in part driven by global processes associated with the El Niño-Southern Oscillation (ENSO). A review of the published and grey literature was conducted to identify epidemic/outbreak events and their temporal and spatial characteristics in Ethiopia for the period 1951-2014. In addition, a detailed analysis of the spatial and temporal impact of ENSO on temperature and rainfall for the periods of 1981-2014 and 1983-2014, respectively, was undertaken using high resolution climate data made available through the Enhancing National Climate Services (ENACTS) initiative. Only nine of the 24 publications and reports note above normal rainfall and/or temperature in association with the observed malaria epidemic/outbreak events. Although no strong association was revealed between the 27 identified epidemic/outbreak events and ENSO phase, 12 malaria events were found to be associated with El Niño; six with La Niña; six with Neutral years; and three with ENSO periods, characterized by a year in which SST modulated between both El Nino and La Nina states. The impact of ENSO on the seasonal climate of Ethiopia was found to be highly significant (p<0.05). Climate change is a critical issue that poses risks to growers and creates a greater need to adopt resilient farm practices that can endure environmental problems. Responses to the risks can be anticipatory, concurrent or responsive. A far more powerful mitigation tool for climate change is the education. Knowledge on climate change will substantially improve the farm practices and better prepare farmers for natural and catastrophic events. Before adopting a new practice, farm and forest managers may want to see the new technique being effectively utilized. The virtual network of field demonstration sites serve as a critical tool for technology transfer, showcasing a variety of climate change adaptation and mitigation strategies that have been implemented across public and private lands in the Northeast. The USDA Northeast Climate Hub and all our land grant partners have worked together on the production of a robust, detailed, and innovative digital experience that can engage people in climate informed decision-making, and immerse the user into a digital field 'visit' that feels "as if you were there". We envision that this project will help build a bridge to climate adaptation strategies. Field visits are a powerful teacher, and we believe virtual field trips can achieve similar results with greater accessibility. DSU’s Smyrna Outreach and Research Center is our pilot site for this project by using high tunnels vegetable production and transitioning into organic vegetable and small fruits production. High tunnels have proven to be very innovative for managing environmental conditions and pests efficiently. The virtual video and other outreach educational efforts have been promoting high tunnel vegetable production in the state of Delaware and beyond. Those educational efforts provide necessary information growers need to sustain their production and prepare them for fast changing climate conditions and disasters. Although many aspects of the tropical response to ENSO have been widely explored, the spatial characteristics of droughts and pluvials remain largely unexplored. In fact, current generation climate models exhibit uncertain spatial signatures of the ENSO tropical teleconnection compared to other aspects ofENSO variability, such as the amplitude of rainfall anomalies. Here, we analyze integrated measures of the spatial extent of drought and pluvial conditions in the tropics and their relationship to ENSO in observations as well as simulations of Phase 5 of the Coupled Model Intercomparison Project (CMIP5) with prescribed SST forcing. Some diagnostics including model ensemble-means and standard deviations of different categories of droughts and pluvials and lagged correlations of these with respect to ENSO-based SST indices like NINO3 are calculated. These diagnostics are discussed in the context of existing theories or frameworks for interpreting ENSO tropical teleconnections. The mountainous East African nation of Rwanda faces climate related food security vulnerability as most of the nation derives its livelihood from agriculture. The majority of the rainfall occurs in two seasons (September-December and March-May). A USAID sponsored initiative through the Consultative Group for International Agricultural Research–Climate Change and Food Security (CGIAR-CCAFS) is underway to improve resilience in the face of these challenges for over one million farmers from 2016 to 2019. Towards this end, forecasting of seasonal onset, cessation, totals of rainfall, dry spells and other variables will be crucial to resilience. A canonical correlation analysis forecast for September-December 2016 is discussed. One challenge is data limitation; meteorological station coverage over nation of Rwanda dropped dramatically in the mid-1990s following the 1994 genocide and has only recently begun to rebound. The Enhancing National Climate Services (ENACTS) initiative has reconstructed rainfall and temperature data by combining station data with satellite estimates for rainfall, and with reanalysis products for temperature. The generated datasets covers the period from the early 1980s to the present and are available at spatial resolutions of 5km. Slesinger, E., Saba, G., Kohut, J., Curchitser, E., Young, R., Nazzaro, L., Seibel, B., Anders, A., Saba, V., Manderson, J., Hare, J., Richardson, D., and Moore, P.
Ocean temperatures along the U.S. Northeast Shelf (U.S. NES) are warming at a faster rate than the global average. This may have profound effects on the distribution and productivity of marine organisms including black sea bass (Centropristis striata), a recreationally and commercially important species. Laboratory studies measuring physiological rates help identify the optimal habitat based on thermal optima curves that show the aerobic scope at a range of temperatures (the optimal temperature is where aerobic scope is highest). Using intermittent respirometry, we measured the aerobic scope of black sea bass at 24°C, 27°C (current temperatures in habitat), and 30°C (future temperatures in habitat). The metabolic rate was significantly higher and aerobic scope significantly lower, at 30°C compared to 24°C and 27°C (p < 0.05). The thermal response curves will be applied to an existing 50-year, three-dimensional hindcast of the U.S. NES (ROMS). Furthermore, we will project habitat quality and quantity and calculate relevant habitat metrics over various climate change scenarios using a high-resolution global climate model. Habitat hindcasts and projections of black sea bass will advance our understanding of climate (variability and change) on this economically important species. There is strong scientific evidence that humans are influencing the climate system. Climate change has, and will continue to impact snowfall, particularly lake effect, within the Great Lakes region of North America. Lake effect snow accounts for roughly 50% of seasonal snowfall in regions downwind of the Great Lakes. Due to the large impact this snow has, it is important to understand what conditions cause lake effect, and how these conditions are changing. While numerous studies have examined trends in snowfall in this region, typically studies treat lake effect as the snow falling within the commonly defined 80-100km lake belt. This method does not necessarily separate snow due to non-lake effect sources. However, by using a synoptic climatological approach that examines only the snowfall that occurs under lake effect synoptic conditions, actual lake effect snowfall can be investigated. This study examines how the weather patterns that produce lake effect snow are changing and in turn, causing variations in lake effect snow. Knowing more about how the climate system is changing will aid in seasonal forecasting and resource allocation for those living within this region. Since the 1997/98 El Niño, there have been significant improvements in our understanding of climate and other drivers of seasonal to inter-annual variations in the infectious disease burden, particularly. The health community has expressed the need for quality assured and locally relevant climate information and training as part of their surveillance activities. However, the complexity of the East African climate has made it difficult to (1) interpret the results of the data provided; (2) develop effective policy responses, (3) develop appropriate training materials. It is only recently that improved methodologies have allowed the health community to use new tools and products, such as those within the Enhancing National Climate Services (ENACTS) Maprooms, to access climate data and information with both national coverage, and local relevance. The International Research Institute for Climate and Society (IRI), in conjunction with the East African NMHS and public health partners, have begun fill the gaps existing in climate and health knowledge and practice, by developing core ENACTS training manuals. Currently these training manuals focus on specific ENACTS products within each countries’ Maprooms to assist in the understanding the role that past and present climate and climate variability can have in sound public health decisions. Climatologies and summary statistics, including the mean, variance, and trend for the abovementioned rainfall variables will be shown. The proposed project sets up a “living laboratory” - a user-centered, innovative test-bed that allows exploring ideas and concepts in real-life cases - both outdoors and indoors: in a computer laboratory of the Bloustein School’s building at Rutgers and in the Somerset-College Avenue intersection, where faculty and students can engage in learning and research on environmental conditions, physical design and occupant/user behavior. The primary goal is to collect objective data on environment (temperature, humidity, noise, lighting, and air quality), and occupant presence and movement through sensors installed in the living lab locations; those will be later blended with subjective data on occupants’ preferences, comfort, and productivity from longitudinal surveys of space users. The merged datasets will be employed in multivariate regression analyses to unfold statistically significant influences among the variables of interest. Path analysis will also generate a values-based framework to predict surveyed behaviors and help us understand the form of functions derived. The ultimate goal is to contribute to a knowledge base of optimizing energy efficiency performance indoors and outdoors for effective long-term climate change adaptation, and suggest sustainable platforms, through conducting true experiments and enriching existing simulation models of physical design, environmental conditions and occupant behavior. During recent decades, more frequent hydrological extremes have inflicted much social-economic damage. The subtropical stationary waves, consisting of monsoon lows and subtropical highs, is suggested to be an important dynamical contribution to hydrological extremes in boreal summer. Observations show that the boreal summer stationary waves index (SWI) – a measurement for subtropical stationary-wave amplitude – has increased by 0.4/decade in the period 1979-2013. Here we investigate the response of SWI to anthropogenic increase of greenhouse gases using 31 coupled GCMs from the CMIP5 archive. The model simulations project an increase in both climatological mean and trend of subtropical stationary waves amplitude by the end of 21st century under the highest emission scenario. This suggests the observed positive SWI trend could be better simulated by runs with anthropogenic forcing than runs with nature variability alone. In addition, compared to historical simulations, the amplified SWI in RCP8.5 is more strongly associated to increased frequency of hydrological events over the subtropical continents. The blacklegged tick, Ixodes scapularis Say, is the primary vector of Lyme disease to humans in the northeastern and Midwestern United States. The distribution of both I. scapularis and Lyme disease has been expanding across the United States over the last two decades and is projected to continue. Maine, for example, saw its first case of Lyme disease in 1986. Cases have been increasing since then, up to approximately 1,500 in 2014. The black-legged tick has a complex life history and transmission cycle for Lyme disease, making it difficult to predict human risk. However, several studies have found an association linking biotic and abiotic factors to the expansion and distribution of Lyme disease; including temperature, vapor pressure deficit (VPD), precipitation, and deer harvest. Using time series analyses, this study aims to understand the effect of various environmental factors on Lyme disease expansion in Maine since 2001. The findings of this study may inform future models of human risk of Lyme disease in Maine. By predicting risk of contact with Lyme disease, health departments can target high risk areas for prevention and diagnosis. 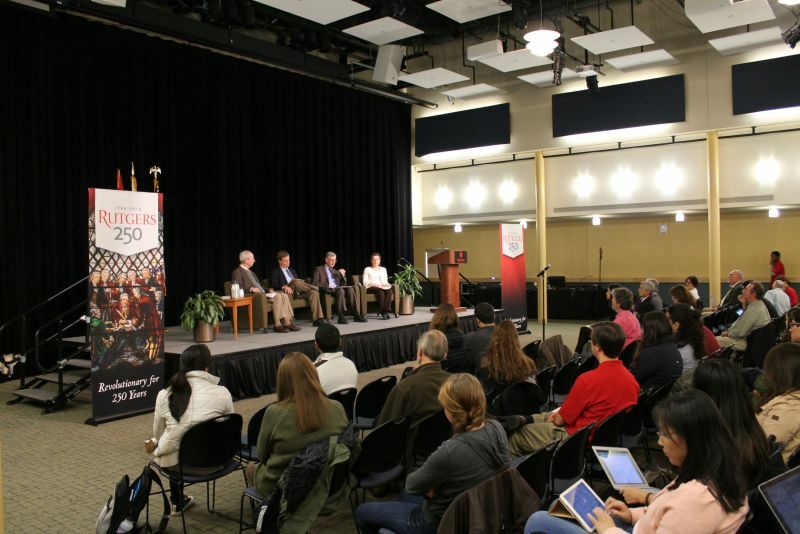 On October 28, 2016, Rutgers Climate Institute, Rutgers Department of Human Ecology, and Rutgers University Press sponsored this public colloquium on the eve of the fourth anniversary of Hurricane Sandy. A distinguished group of faculty and thought leaders came together four years after Hurricane Sandy made landfall in our region for an informative dialogue about storms and climate change vulnerability centering on issues raised in this publication from Rutgers University Press. The editors and chapter authors including Frank Felder (Bloustein School of Planning and Public Policy, Rutgers University), Mariana Leckner (Leckner Consulting), Karen O'Neill (Human Ecology, Rutgers University), Daniel Van Abs (Human Ecology, Rutgers University), participating in this event noted the lack of recognition of longer term risk of coastal hazards which has been overshadowed by short-term pressure to build bigger and better following Sandy. A session looking forward moderated by Mark Mauriello (Edgewood Properts and former New Jersey Department of Environmental ProtectionCommissioner) included former New Jersey Governor James Florio and Dr. Christopher Daggett, both a former EPA Regional Administrator and New Jersey Department of Environmental Protection Commissioner who discussed the need for leadership to prepare for climate change, including sea-level rise, along the New Jersey coast. Read this article in the Press of Atlantic City which featured the event. Speaker biographies for this event can be found here. Photographs from this event are below. 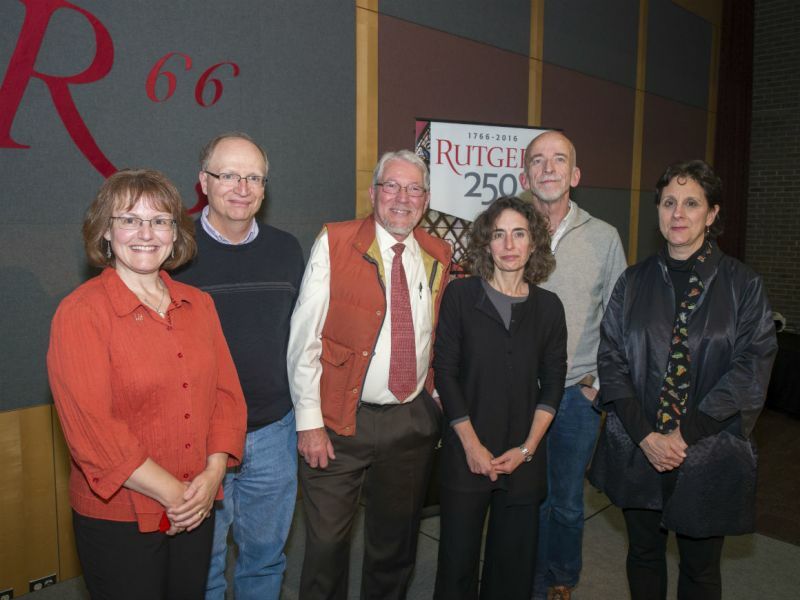 On October 26, 2016, Rutgers University welcomed Pulitzer Prize winning author, Elizabeth Kollbert who spoke on "The Sixth Extinction". 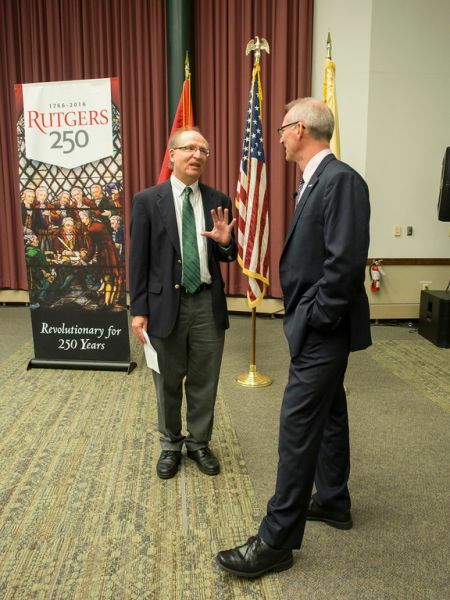 This event was part of the series, "Exploring the Anthropocene: The Age of Us" as part of the School of Environmental and Biological Sciences (SEBS) celebration of Rutgers 250th Anniversary. 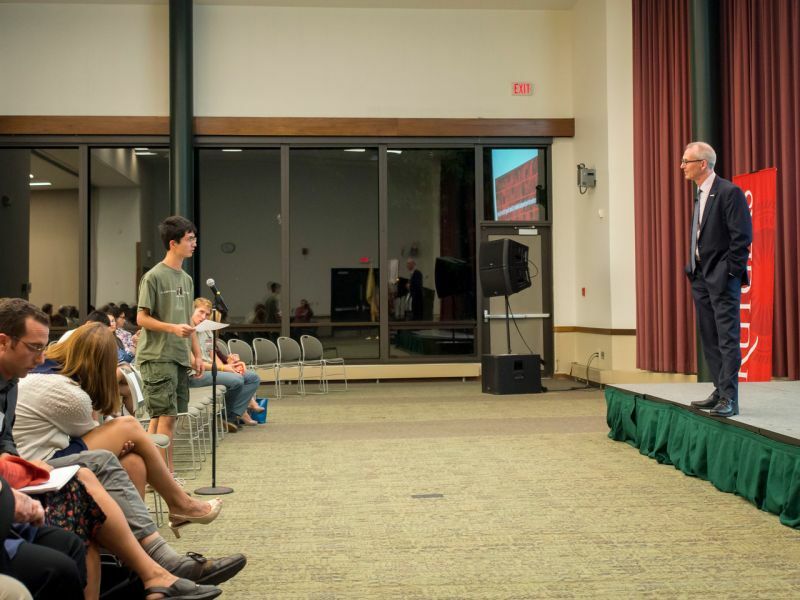 In addition to SEBS, this event was co-sponsored by Writers House, Rutgers Climate Institute, Undergraduate Academic Affairs, Institute of Earth, Ocean and Atmospheric Sciences and RU250. Elizabeth Kolbert traveled from Alaska to Greenland, and visited top scientists, to get to the heart of the debate over global warming. Growing out of a groundbreaking three-part series in The New Yorker (which won the 2006 National Magazine Award in the category Public Interest), Field Notes from a Catastrophe: Man, Nature, and Climate Change brings the environment into the consciousness of the American people and asks what, if anything, can be done, and how we can save our planet. She explains the science and the studies, draws frightening parallels to lost ancient civilizations, unpacks the politics, and presents the personal tales of those who are being affected most—the people who make their homes near the poles and, in an eerie foreshadowing, are watching their worlds disappear. Field Notes from a Catastrophe: Man, Nature, and Climate Change was chosen as one of the 100 Notable Books of the Year (2006) by The New York Times Book Review. Her most recent book, The Sixth Extinction: An Unnatural History, a book about mass extinctions that weaves intellectual and natural history with reporting in the field, was a New York Times 2014 Top Ten Best Book of the Year. The Sixth Extinction also won the 2015 Pulitzer Prize in the General Nonfiction category and was a finalist for the National Book Critics Circle awards for the best books of 2014. As with Field Notes from a Catastrophe, The Sixth Extinction began as an article in The New Yorker. Elizabeth Kolbert has been a staff writer for The New Yorker since 1999. She has written dozens of pieces for the magazine, including profiles of Senator Hillary Clinton, Mayor Michael Bloomberg, and former Mayor Rudolph Giuliani. Her series on global warming, "The Climate of Man," appeared in The New Yorker in the spring of 2005 and won the American Association for the Advancement of Science's magazine award. Also in 2006, she received the National Academy of Sciences Communication Award in the newspaper/magazine category and was awarded a Lannan Writing Fellowship. In September 2010, Kolbert received the prestigious Heinz Award which recognizes individuals who are addressing global change caused by the impact of human activities and natural processes on the environment. She also won a 2010 National Magazine Award in the Reviews and Criticism category for her work in The New Yorker and the Sierra Club's 2011 David R. Brower Award. She recently won the Walter Sullivan Award for Excellence in Science Journalism from the American Geophysical Union. Elizabeth Kolbert's stories have also appeared in The New York Times Magazine, Vogue, and Mother Jones, and have been anthologized in The Best American Science and Nature Writing and The Best American Political Writing. She edited The Best American Science and Nature Writing 2009. A collection of her work, The Prophet of Love and Other Tales of Power and Deceit, was published in 2004. Prior to joining the staff of The New Yorker, Kolbert was a political reporter for The New York Times. 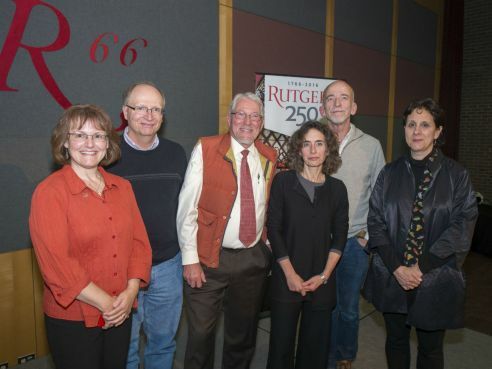 Pictured from Left to Right are Xenia Morin (Plant Biology and Pathology), Tony Broccoli (Rutgers Climate Institute), Executive Dean Robert Goodman (School of Environmental and Biological Sciences), Elizabeth Kolbert, Mark Doty (Writers House) and Marjorie Kaplan (Rutgers Climate Institute). 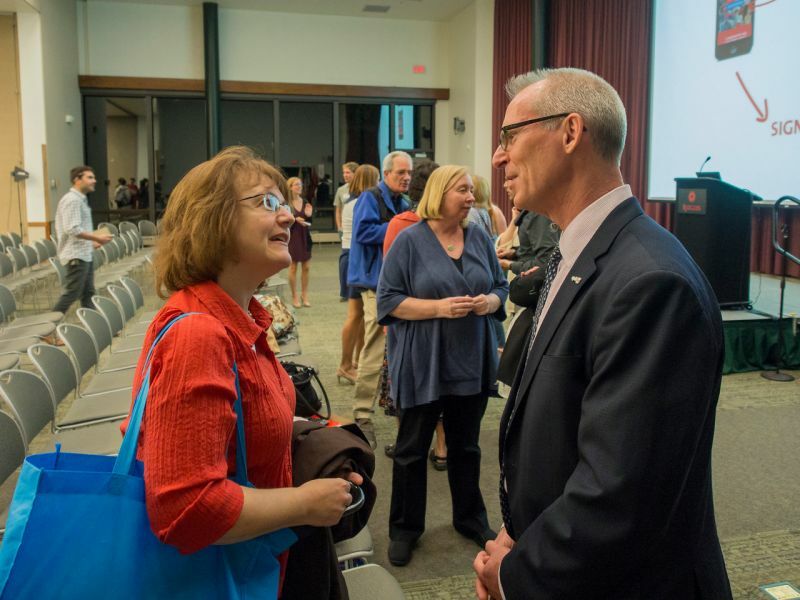 On September 26, 2016, almost 200 students, faculty and members of the public came to hear a lecture by former Congressman Bob Inglis, on Climate Change, Energy and the Politics of 2016. 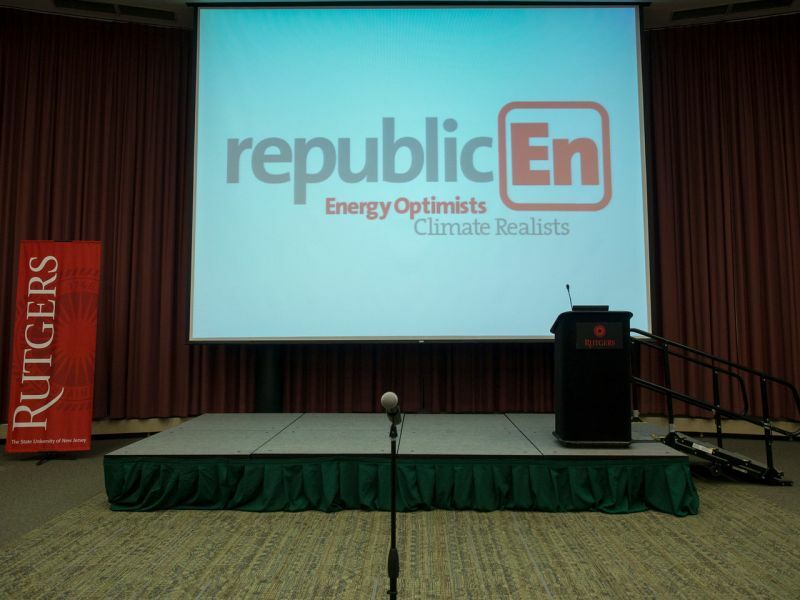 The event took place in the Cook Student Center and was sponsored by Rutgers Climate Institute, Rutgers Energy Institute, Cook Campus Dean, Undergraduate Academic Affairs, Department of Human Ecology, SEBS 250, and the Eagleton Institute of Politics. In September 2016, Inglis was named to the "Politico 50", Politico's guide to the thinkers, doers and visionaries who are transforming American politics in 2016. For his work on climate change, Inglis received the 2015 John F. Kennedy Profil in Courage Award. He appears in the film "Merchants of Doubt" and the Showtime series "YEARS of Living Dangerously." Congressman Inglis spoke with passion about how conservatives can be part of the solution to climate change. As a member of Congress who served on the House of Representatives Science Committee, he learned first hand about climate change from a trip he took to the Antarctic, as well as spending time with a scientist studying coral reefs on the Great Barrier Reef. He spoke about the importance of message, messengers and momentum and about his take on free enterprise solutions to climate change through a revenue neutral carbon tax on fossil fuels for transportation and electric generation. In addition to his public lecture, Congressman Inglis met with Rutgers undergraduate and graduate students during visits to several Rutgers classes, as well as over a dinner for 20 Rutgers student leaders and a breakfast with the Rutgers Republicans and Young Americans For Liberty. 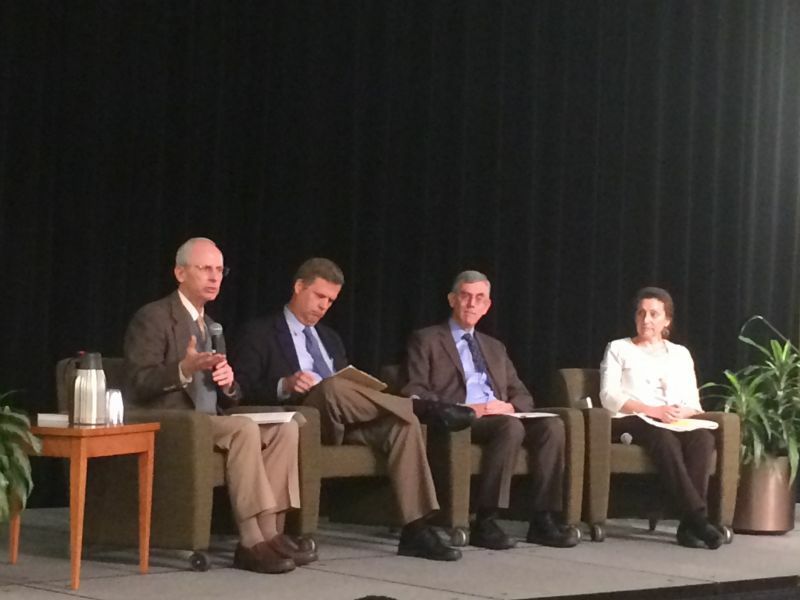 Pictured from Left to Right are Beatrice Birrer (Rutgers Energy Institute), Rachael Shwom (Department of Human Ecology); Marjorie Kaplan (Rutgers Climate Institute), Robert Kopp (Rutgers Energy Institute); Honorable Robert Inglis (George Mason University-RepublicEn); Judith Storch (Cook Campus Dean); Tony Broccoli (Rutgers Climate Institute), Randi Chmielewski (Eagleton Institute of Politics).